James E. “Jim” Miller, 72, of Wapakoneta, passed away at 3:40 p.m. Thursday, April 11, 2019 at his residence. He was born on June 21, 1946, in Celina, to Clinton J. “Babe” & Nellie M. (Armstrong) Miller, who have preceded him in death. On August 4, 1984, Jim married his best friend, Joyce A. Drury, who survives. Survivors also include two daughters, Lori Fronig, of Sidney and Aimee Wicker, of St. Marys; his first wife and the mother of his daughters, Shirley (Schafer) Maurer, of New Knoxville; three granddaughters, Ashley, Shay, and Alyssa; and one great-granddaughter. Jim was also preceded in death by his sister, Mary Jane Miller. A 1965 graduate of Wapakoneta High School, Jim worked at Marsh Food Store while in school and was able to purchase a car, the envy of all his friends. In February of 1966, Jim enlisted in the United States Navy, serving until he was honorably discharged in December of 1969. Upon returning home, Jim began a career with Minster Machine in October of 1970, working in numerous capacities until his retirement in April of 2014. Jim was a character in every sense of the word. He was rarely seen without a smile or at least a smirk on his face. In addition to his group of closest friends, Jim was a “people person”. 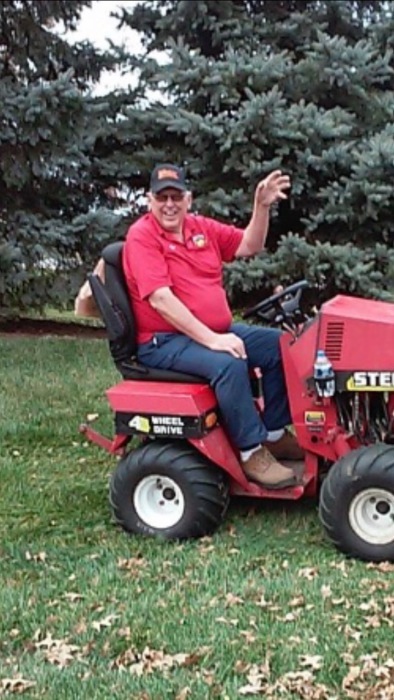 For over 33 years, he and Joyce ran Sunshine Lawn Care. He loved being outside, whether on his mower or his motorcycle, Jim and Joyce were always together. They enjoyed many trips on the bike, sometimes in a group, sometimes just the two of them. Jim always managed to find a road they hadn’t traveled down before. In his free time, he enjoyed raising alpacas. Jim and Joyce could be seen around town with their favorite alpaca, Joey. His life motto was “If I can make one person smile today, then it has been a good day.” The best way to honor and remember Jim would be to continue his love of spreading smiles. A time to share memories will begin at 4 p.m. Saturday, April 20, 2019 at Schlosser Funeral Home & Cremation Services. Friends may call from 10 a.m. until 12 noon and 2 p.m. until the time of sharing on Saturday, April 20, 2019.